What Amazon seller wouldn’t want an easier way to find profitable products? Everyone, I assume! So I was so excited to get your feedback on the product, and it has been really enthusiastic and positive, which is awesome, but I realize that there are also a few outstanding questions. How does it work? Am I using it correctly? What strategies can you recommend? I apologize if there is any confusion, but if you’ve been knee deep in Niche Hunter-land for months on end like I have, you also may start assuming that everyone knows the ins-and-outs of Niche Hunter as well! Why does Niche Hunter return brand names on items? How am I supposed to compete against big brands? 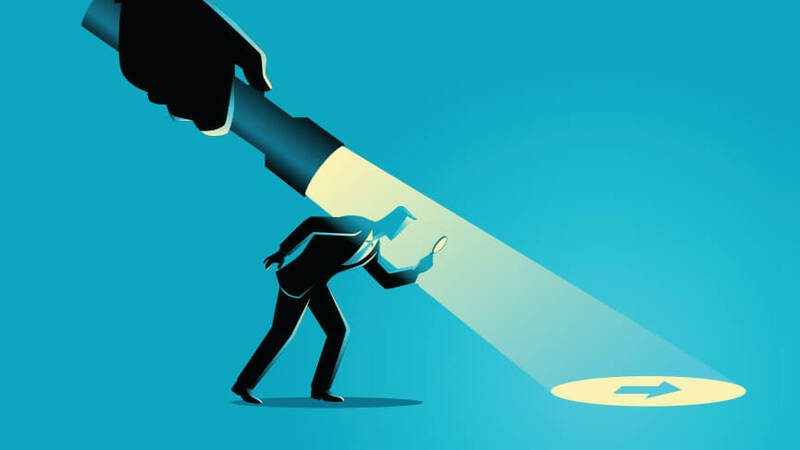 So at a high level, this is how I can uncover high-potential niches from brand names: find the long-tail keyword and descriptors that are related to the brand name, and then dig deeper into what that product is other products and sellers in the niche. What is a long tail keyword and why is it relevant? 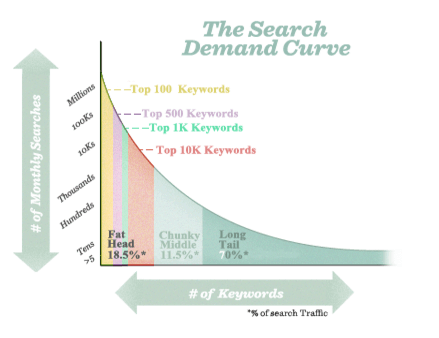 The Search Demand Curve, via Moz. Say for example you are shopping on Amazon for audio speakers. The head term would be “speakers”, and if you typed that into the Amazon search, you would get a bunch of varied answers that would be Amazon’s best guess of what you are searching for. Chances are that you won’t find what you are looking for. However, if you were very specific, and typed in a long tail version, or a more descriptive search like “portable waterproof bluetooth speakers” you would get a much more relevant set of results. Why is this important? Because as Amazon sellers, we want to identify the products that have significant demand and limited competition. If you are able to hone in on very specific long tail search terms, and create a product listing that includes those keywords, you increase your likelihood of ranking highly for those search terms. Furthermore, the more detailed the search query, the more purchase-oriented the user is. Someone who is looking for “speakers” may be in the research or discovery phase, and may not be ready to buy the product immediately. However, once they include the specific details of a long tail search, you can assume that they are further along in their journey to a final purchase. This is good for us as Amazon sellers, exactly when we want our product to appear in their search! Why does Niche Hunter not return the same thing as when I key that keyword into Amazon? The results are way less. This is true, that the Niche Hunter will not return the exact same results as if you typed in the keyword into Amazon. Due to the size of Amazon’s catalog, we are choosing the top keywords for Niche Hunter and continue to add more every day. As of today, we have over 1 million keywords in Niche Hunter and are adding a few hundred thousand each week based on popularity of searches. You will see the Niche Hunter library increase over time, so keep checking back for new and different ideas! Do I have to have all green monkeys? This is my solution to help you identify more product ideas with greater speed. You don’t need all green monkeys in order to find a winning product—everyone’s criteria of a good product is different, so I can’t recommend a one-size fits all answer. 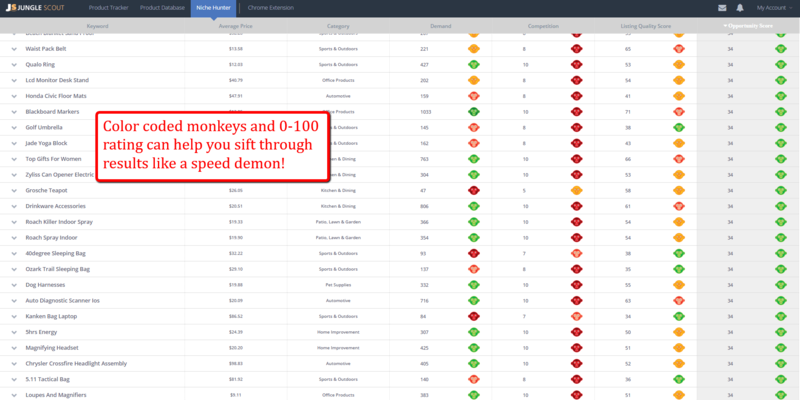 However, even if you see some red monkeys in the results, it may still be worthwhile to click through. The key is that you start generating new ideas, clicking around, and follow the trail of keywords until you uncover the right niche and product idea for you! How do I know that the keyword that the Niche Hunter supplies is the keyword that actually produced their sales? And is that important for me to replicate what they are doing? Honestly there is no way for you to identify exactly which keyword is the revenue generating keyword for a given product. Niche Hunter is a building block to help you generate ideas. The only way to tell which keyword is the best on each product is to actually be the seller. I would guess “microfiber glove” and “car wash mitt”, mainly because it is the first keyword in the listing, and repeated in several places throughout the listing. I think that it is always good to place the main keywords at the front of the listing. By the way, if you have a car, you should get one of these…..it will help you always keep your shine on, I’m sold on this product! How do I use Niche Hunter with the other Jungle Scout products? How do I leverage the results I find in NH to help me find a product to sell or private label? Niche Hunter is a great tool for your private labeling toolkit. 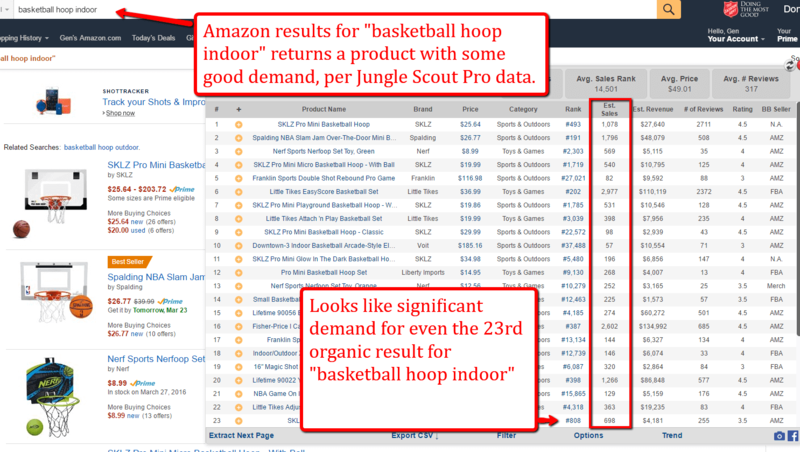 You can use the Jungle Scout Extension to help you gather data from a specific page on Amazon. This is great for really digging into a product category or niche, doing competitive analysis, and “spying on competitors” to see what else other sellers are finding success with. The Web App helps users come up with product ideas using the Product Database, after creating a set of filters like demand, competition, net margins, etc. The user can then track those products over time for actual Amazon data gathered to verify whether the product is something that they want to pursue further. Lastly, the Niche Hunter takes a different approach and looks at keywords instead of specifically products. The Niche Hunter is almost a shotgun approach, where you can hit a bunch of potential products at once. Niche Hunter really rounds out your private label product research toolkit and gives you a way to look at potential products from all angles. If you were running a search in NH, what are the steps you would take, from start to finish? I think that the best approach to starting a search in Niche Hunter is to start with a broad set of criteria, and continually narrow down until you find a manageable set of criteria to scan through, which may be a few hundred to a few thousand, depending on how carefully you want to explore each result. When creating the user interface of Niche Hunter, I really wanted to make it as simple and intuitive as possible. There are so many different filters that could have been included, but I think that we have narrowed it down to the most important metrics to you as a seller, which includes: Category, Demand, Price, Competition, Listing Quality Score, Opportunity Score, Word Count, and Search Keyword. Each of these is important and can help you quickly refine the results to be a manageable number. One helpful thing is to include the maximum 100 results per page. Because I like to move through my product research with speed (based on doing hours of this in the past! ), it speeds up the process by having as many results as possible. Speed and execution is the name of the game with Amazon product research, so every bit helps! Myself and my partners purchased the web app. We are excited that we are able to have 3 users on the package we chose. However, now looking at purchasing the Chrome Extension– Will the three of us be able to use that as well? Whether i have been struggling to sort out a good to do work with for profit. I used many types of paid and free tools. But, i am stack on JungleScout! There are lots of reasons to say. Handy to use, reliable result, competitive pricing are the most prominant logics to use this tool. Can you make these blogs printable word or PDF document ? The images shown in this blog do not match the most current version of the Jungle Scout Pro Web App…. How can you tell if a product is patented already by someone else? Also, you can find a good patent/trademark attorney on a site like Fiverr that can do the leg work for you. I’ve done this in the past. I paid $10 and got a full report from a licensed patent attorney. If you really need to go all out, you can always hire a full fledged patent attorney to do even more research for you. Sorry about that, all of our videos and resources are in English. Thanks for your suggestions about Chinese subtitles. Unfortunately not, the extension will not work on an iPad 🙁 The Chrome app doesn’t have the capability to work with extensions, (I don’t think iOS allows it). If this ever changes, we will support it, but until then you can only access the extension on a desktop. Here are five nifty and easy steps to create that clinching first info product. Offices or County Officials Buildings should aid these questions. have not heard of that one, thanks for sharing! Not every method will generate the income you are searching for, but a serious amounts of effort spent researching the top methods, you could become a business online person without any current pre-qualifications. entranceway of “Empower Network. Several weeks ago a Twitter message broadcast from our account was responded to by Coca Cola in a hour. agreed, with proper due diligence and product research, there is no pre-requisite in order to achieve the success you wish/plan for! 1) If big brands coming with poor rating (like 3-4 ratings) for particular keyword — can I beat such keyword and rank it in top 10? 2) Can I resell the any particular very branded product ? (The same brand is also selling on the same platform) — Will it create a issue? 1 – It’s entirely possible to beat bigger brands in the Amazon race if you notice that they have poor quality listings, low BSR (rank) and so on. It just takes time and dedication on the sellers part to ensure you are offering a product that is as good if not better, and create better listings and employ smart Amazon marketing tactics. 2 – You cannot resell an already branded product (unless you do so as a wholesaler with explicit permission from the brand owner). For private labelling, what you need to do is manufacture a similar product under your own brand name. Of course, you also need to make sure you work on due diligence and ensure you don’t infringe any patents or other intellectual property in doing so. So simple yet so powerful…thanks much… I’m going to add this process to my new health niche I’m starting already… more ammo to speed up my progress & profits! Great to hear, hope it helps! awesome content as always, thank you. How can I have a 7 Days Free on NH? And… please explain what exact mean 180 products. Per month? Or? We do not have a free trial for the Niche Hunter, but you can get it with any Standard or Business plan of the Web App. 180 refers to the number of sales per month. hope this helps. I’m still confused about the 180 products Gen, would you mind if you elaborate more and with an example just to clarify the feature correctly and effectively. Thank you for answering to us Gen! Basically, if you see “180” in the Estimated Sales column, it means that the Jungle Scout algorithm estimates that 180 widgets are sold per month. hope that helps! selling on amazon for 2 years. u offer good points, but you missing some important too. can you explain “My formula for selling on Amazon: speed + execution = success” a bit more? as my guess, the more speed, the less focus and will miss some good product? May I know how to get the free 7 Day trial of Niche Hunter? I would like to explore more before I decide to sign up for that package or just the basic one.Thank you. Really sorry but this blog post was a little out of date, thanks for the reminder to fix that! Having said that, I have asked the customer support team to get in touch with you via email to help you out! I am currently researching with the Jungle Scout Extension. I picked a product. What does it mean if all other listings have AMZ as their BB Seller. Is it a good sign, as there are no other FBA guys? Or is it a bad sign as I’m competing against amazon all the time? Thanks for shedding some light on this issue. Any plans to re-architect the JungleScout Pro extension to leverage the Niche Hunter database, or otherwise do away with the customer API key requirement? The requirement to use the MWS API Key for the Pro features is a non-starter for me, personally. I reread this blog twice so to be sure I’m maximizing and using NH correctly. Sounds like the goal is to find longtail kw with niche opportunity. My question is do I apply your production selection criteria (sum 1k demand, <100 reviews in top 5 and top 10 listing etc) on this longtail kw or primary kw? Example: basketball hoop = bad opportunity. However, indoor basketball hoop = good opportunity. Is this a go? Be great to hear from you. Thanks! That is a good question, and probably depends on personal preference. I think that there is a difference between targeting a very specific niche, and creating a common and competitive product and just targeting long tail keywords. I think that you would be taking on less risk if you apply the production selection criteria to a less competitive main keyword. Because theoretically it would be easy for your competition to adjust keyword targeting and the listing and then compete for the longtail keyword. I hope that answers your question! does $69 plan come with niche hunter? Yes, the $69 plan comes with Niche Hunter.